The use of range riders and fladry here in Arizona confirm your comments regarding non lethal vs lethal means of controlling Mexican Gray Wolves. Hasn’t had any effect on AZ Game and Fish releasing more to the wild though. To the best of my knowledge, myopathy is not a condition that Wildlife Services personnel would be capable of diagnosing in the field. In fact, the condition occurs in tissue that would require “tissue sampling”, storage and laboratory analysis. I would challenge any Wildlife Services trapper to eyeball a dead livestock carcass and prove, let alone confirm, that the animal died from myopathy especially relating it to wolves.Laboratory tests would not be timely or cheap either. 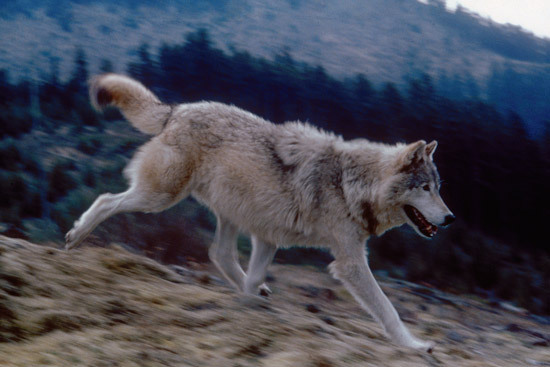 In the meantime, does the agency kill the wolves first and look at lab tests later? And how much of that muscle weakness (caused by overexertion/stress) might just be caused by trucking cattle into public land grazing allotments? (perhaps not showing up for days?) Or say a 10-15 mile “hike” on paved roads to public lands, after being restricted for months,in small pastures, during the long winter months? Recall a couple of years ago, working next to a ranch that trucked their cows in for the spring/summer & fall (no cows there for the winter) and out of the 8-10 cows I saw wandering around, who had just arrived, 3 of them were lame. Even with 4 legs, its no picnic for a cow (or a cow with a young calf) to be herded on to a double decker, cattle truck and then driven sometimes 100 miles or more, to a public land allotment. Can also recall being right next to Rose’s Cantina in Jackson (Elk, you know the place 🙂 and cattle truck drivers would stop for a leisurely hour lunch break (often more if you ran into a neighbor or friend) while their load (cattle) sat in 90 degree temps. Well said…your words need to be sent to more places and people so this terrible system of assuming the cattle died of this will be extinct. I just do not understand how people can get away with everything that goes on. Two words perhaps….money and politics. The effectiveness of animal damage control is rather a secondary consideration. The ADC now called wildlife services I guess, wants to keep the animal body count up to keep their budget up. During the early 1980’s I witnessed the ADC’s bureaucratic senselessness when they wanted to include about 65,000 acres of BLM land in their control area. They attempted to justify this request because they found a calve carcass(very much decomposed) that might have been killed by a coyote and because a skunk killed a couple chickens on private land adjoining public land. Ironically, the BLM denied their request not because there were endangered species on public land, but because BLM managers feared lawsuits from public land users that might get injured or lose a dog when hunting. These people are ruthless and morally corrupt, but such is the entrenched capitalistic system. Montana’s democratic senator recently introduced legislation to reduce rules and regulations on livestock hauling. It seems that the old guard utilitarian attitudes are being reintroduced at the expense of animals whether they are predators or livestock. I’ve wondered also if it to keep their budget up and jobs. Myopathy can also be caused by genetic disorders or dehydration, especially in species not native to western ecosystems and therefore less adapted. Plenty of newcomers to public lands grazing have bought the wrong cattle and lost many as a result, mostly from them being unable to deal with high altitudes. Any animals exhibiting these symptoms would be more attractive to predators, too. So if a carcass is found days after death and has been significantly scavenged, it is as likely they were eaten after death as attacked as weak and killed by predators.